Jacquie and her husband have traveled all over the world to obtain the photos she uses for her paintings. Their trip to Africa was a life-changing experience for Ms. Vaux. To the present day, her paintings of African wildlife reflect her first-hand adventure. Now a full-time resident of Fort Collins, Colorado,she hikes the Front Range regularly carrying her camera to capture the local wildlife. Although she has worked in several different painting media including oils, acrylics and gouache, transparent watercolors remain her favorite. During her career, Jacquie Vaux has had more than 50 paintings reproduced into limited edition prints, all of which have sold out. Recently she has published several new Giclee prints on canvas and on paper; all of which have been extremely well-received. Art Advocate Gallery, Loveland, CO; Gallery 116, Vail, CO; and Olympia Nature World, Tokyo, Japan. Jacquie continues to expand her skill and knowledge at Artists’ Workshops. 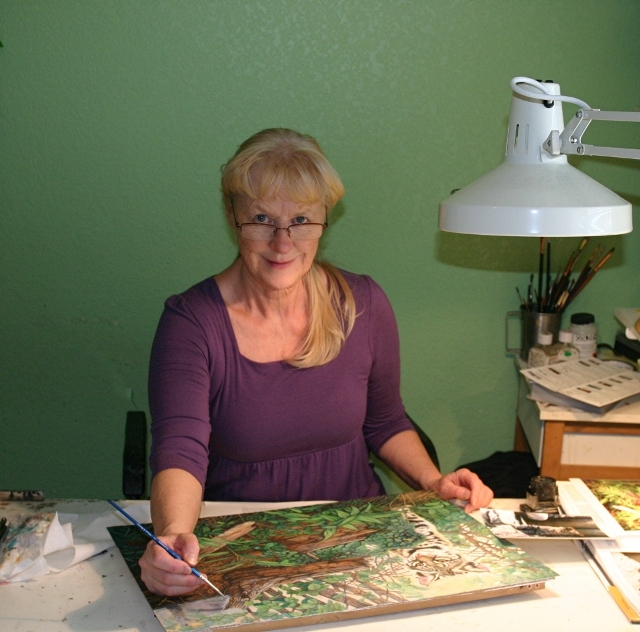 She has studied with many master artists including: Robert Bateman, Carl Brenders, Terry Issac, Rod Fredrick, Richard Sloan and Steven Quiller. During her entire career Vaux has been a dedicated Conservationist, donating many of her art works to fund-raising activities which benefit endangered wildlife. The organizations she has supported are too numerous to mention, but include: , The Wild Animal Sanctuary (in nearby Keenesburg, CO) The National Audubon Society, The World Wildlife Fund and The Nature Conservancy. Jacquie Vaux’s artistic expression continues to evolve. Her love of painting wildlife is clearly demonstrated by her artwork. Take a close look at one of her paintings, and I'm sure you’ll agree.